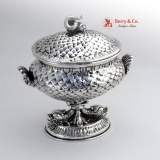 Magnificent sterling silver gold rimmed large round box with gold rimmed inset mirror on the roof of lid. 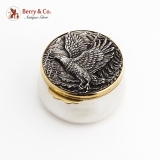 Lid of box features a majestic relief eagle soaring above trees and mountains. Made by Buccellati. 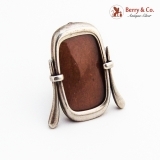 This marvelous box measures at 2" in diameter, 1 1/4" tall, and weighs 66 grams or 2.1 ozt. Cheval Style Miniature Picture Frame Easel Back Sterling Silver c. 1960, Italy. This pretty frame is 1 3/4" tall, 15/16" wide and 1 1/2" from foot to foot. Repousse Ornate Italian Picture Frame Blue Velvet Back 999 Sterling Silver c. 1980. 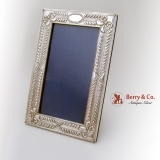 This lovely frame is a size 7 1/2" x 11 3/4" (suits 5" x 9" photo). 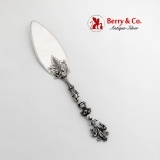 Ornate Pastry/Cake Server Figural Cherub Decorations & Fleur De Lis Finial, Engraved Blade Peruzzi Brothers 800 Standard Silver Florence, Italy. This splendid server is 11" long and weighs 143 grams or 4.6 Ozs. Troy. Spectacular ice bucket in the form of a wishing well. complete with a block and tackle bucket hoist. The inside of the well is fully gilt and has its original footed, gilt drain pan. The shot sized bucket would have been filled with vodka and lowered into the ice to keep its contents cold. The body of the well has upper and lower bulbous bands of engraved snowflakes set on lined backgrounds, with the bands surrounding a brickwork center. It all sits on a wide gadroon base. 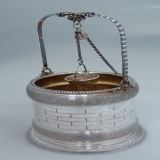 The block and tackle bucket winch is attached to a fancy gadroon frame, with the silver bucket chain being secured to a hook on the side of the beaded rim of the well body. Calderoni has been in business since 1840 and has long been noted for superior design and quality of manufacture. This wonderfully whimsical ice bucket is certainly no exception. The bucket and drain pan weigh 461 grams or 14.8 ozs. Troy and stand 9" tall, with a 5" diameter base. The excellent original condition, with no monograms, removals, repairs or alterations make this a truly special offering. We hate to use the word unique, but unique would seem to describe this special ice bucket..